Two weather systems will play a role in the week's weather. For the next 24 hours or so, however, pleasant fall high pressure dominates and will make for a nice night for trick-or-treaters. Clear skies and light wind will allow temperatures to fall into the 60s this evening, so it won't be very cold for the candy-hoarding ghouls and goblins! Monday will see an increase in high clouds, but still pleasant temperatures with highs in the 70s. The first weather system to affect the area will be low pressure, mainly at the mid levels, dropping out of east TX into the north-central Gulf of Mexico on Tuesday. It will be close enough for showers to form over the lower Mississippi River Valley and affect the Mid-South late Monday night into Election Day. Most of the rain will remain over north Mississippi, but showers are also expected in the metro area. Voters will want to take their umbrellas to the polls. There won't be enough rain to significantly aid the drought conditions, but any amount will certainly be welcome! This system will move out Tuesday night with an "in-between" day Wednesday as high pressure briefly builds in. The second major system will be a very deep (strong) upper-level trough that drops south over the Mississippi River Valley Thursday and moves slowly east Friday. This trough will bring much cooler temperatures for the end of the week and early in the weekend before it moves out. Very little, if any, rain is expected with this system. After a nice rain yesterday (most areas received anywhere from 0.50"-2.00" of rain Sunday), another round of storms will be knocking on our doorstep early Tuesday. A very strong low pressure system will explode over the Northern Plains tonight (see the first map above, valid at 7am Tuesday). That low will quickly usher through a cold front that will blast through the region during the morning hours. Due to the strength of the entire system, high wind will be the primary threat, even before the storms get here. Southerly wind will gust above 30 mph, perhaps with isolated gusts to 40 mph, after midnight tonight through the mid-morning hour tomorrow. As the front nears, a squall line is expected to form and race through the region. The wind driving the front will be blowing at near 70 mph in the lower levels of the atmosphere and some of this wind could get pushed near the surface in the storm downdrafts, bringing a threat of isolated damaging wind gusts. For this reason, the Storm Prediction Center has issued a SLIGHT RISK of severe weather for the metro area for tomorrow morning (see map 2 above). Behind the front, skies may clear briefly, but expect a mostly cloudy day with wind diminishing during the afternoon and temps falling through the 60s. 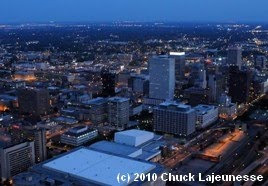 MemphisWeather.net will have you covered during this potential severe weather event. 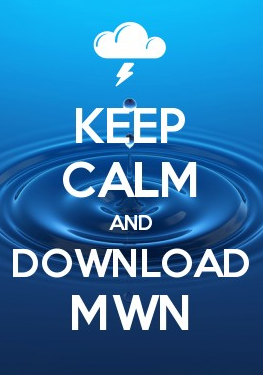 Regular updates will be provided on our social media channels (see links below) and interactive MWN StormView Radar will show you where the storms are, where they are headed, and just how strong they are. 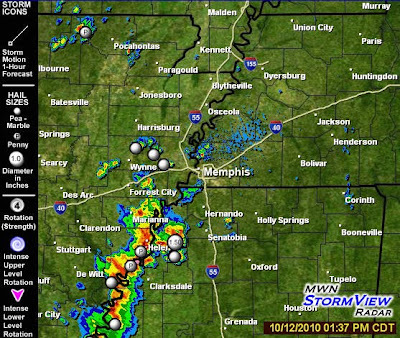 Be sure to also sign up for severe weather alerts for the Memphis metro area, courtesy of MWN. Sometimes it gets tiring to write about the same topic over and over again, but in this case it bears repeating as a drought record went into the books this week. The map above of this week's Drought Monitor is the result of the lack of rain for the past 2 months. As of today, October 21, it has been 60 days since Memphis received 0.10" (one-tenth of an inch), a record that eclipses the previous high of 55 days set back in 1953. There is some potential good news in the forecast, however. A shift in the upper level pattern will result in better rain chances beginning Sunday and lasting into next week. The Mid-South will see an increase in humidity on a southerly wind beginning Saturday, setting the stage for scattered showers and likely some thunderstorms Sunday into Monday. Tuesday and Wednesday will probably be a little drier, though still warm and humid, Then, what could be a large-scale system will be coming through in the latter half of next week. That one will bear watching - stay with MemphisWeather.net. Details on the expected conditions for the upcoming 7 days can be found in the MWN Forecast. 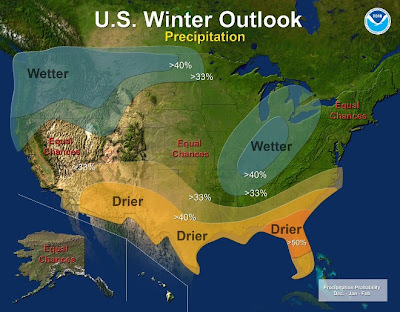 It was about this time last year that I issued my MWN Winter Outlook for 2009-2010, in the midst of a mild El Nino winter. At that time, I expected the winter to be drier than average and temperatures slightly above normal. I went one for two. According to climate statistics from Memphis International Airport for December 2009 through March 2010, temperatures and precipitation were below average in each of those months. (In fact, February temps averaged a whopping 7.5 degrees below normal.) In addition, I expected at least one "couple inch" snow event. That is exactly what happened, when a 5"+ snowfall occurred on February 8, 2010 (much more fell not too far north of the airport), in addition to an inch-and-a-half event in January. For the upcoming winter, the global setup is opposite of last winter. A fairly strong La Nina event is in progress, which means cooler than average sea surface temperatures (SST) in the eastern equatorial Pacific. The bottom image below shows the Pacific SST anomalies as of early-October - note the below normal SSTs in the eastern Pacific. What does a wintertime La Nina typically mean for the eastern U.S.? The map below shows what to expect in general terms, courtesy of NOAA. The dark blue lines are the average positions of the jet streams. From this map, the Mid-South could expect above normal temperatures, wet conditions, and a potentially active pattern due to the jet stream being positioned overhead. This combination could mean the potential for strong to severe weather at times. Indeed, NOAA's Climate Prediction Center long-range forecasts for this winter indicate above normal temperatures and precipitation for the December-February time period - or a warm and wet winter. The last La Nina winter was 2007-2008, which you may recall produced the Super Tuesday tornado outbreak on February 5, 2008. 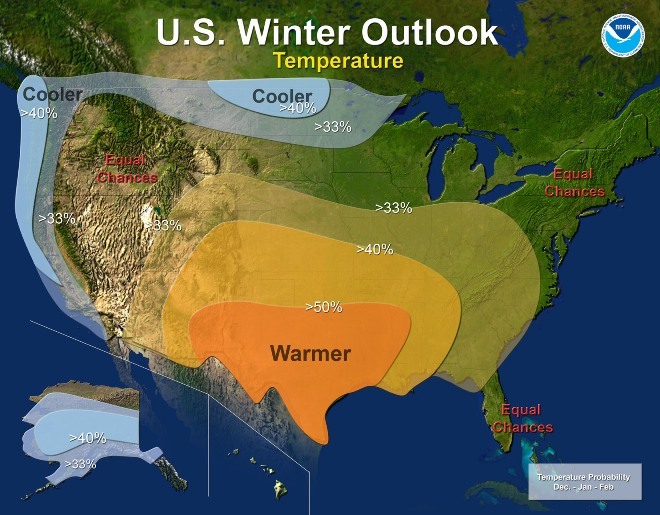 Earlier today, NOAA issued their official winter outlook which nearly mirrors the conditions that would be expected under a La Nina, as it will be the most dominant feature impacting North American weather this winter. The images below show the temperature and precipitation outlooks from NOAA (click for larger images). Given the La Nina conditions in place and the confidence that this scenario will continue throughout the winter months, I believe we could see an end to the drought conditions by mid-winter (if not before) as above normal precipitation will be likely. In addition, the possibility of a mid-winter severe weather event would appear to be slightly higher than normal given the average jet stream position over the region. This jet position would favor storm systems of Pacific origin moving across the region fairly often, resulting in above normal precipitation. Increased clouds and precipitation would result in above normal low temperatures, while the position of the Arctic jet stream well to the north would mean above normal temperatures as well. Thus, temperatures will average above normal. Farmer's Almanacs side-note: Both the Farmer's Almanac and Old Farmer's Almanac are forecasting cold conditions and average to below average precipitation. With all due respect to both, I disagree. 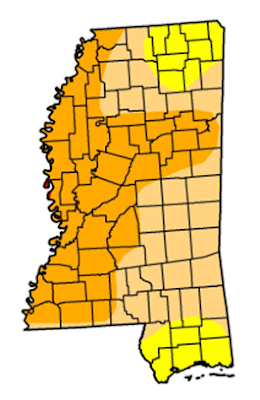 According to the U.S. Drought Monitor, which I now check weekly, the Mid-South drought has expanded and strengthened. In the regional map (shown above - click for larger image), the states of Louisiana, Mississippi, most of Arkansas, and west Tennessee are experiencing drought conditions. In fact, the metro area is now under D1-D2 (moderate to severe drought) conditions (severe drought in Shelby County). 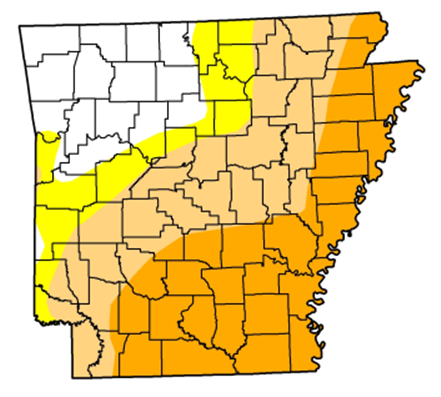 A close-up of Tennessee, Mississippi, and Arkansas, seen below, show the drought conditions by county. These maps were released prior to Tuesday's rain, but there certainly was not enough, especially across Arkansas and Tennessee, to significantly reduce the impact. Memphis International Airport has recorded only 0.22" of rain (less than 1/4") in the past 53 days, since August 22. UPDATE: The RED FLAG WARNING was cancelled at 2:03pm Thursday. .LOW RELATIVE HUMIDITY... DRY FUELS AND GUSTY WINDS WILL RESULT IN RED FLAG CONDITIONS ACROSS EASTERN ARKANSAS... WEST TENNESSEE AND NORTH MISSISSIPPI THROUGH LATE AFTERNOON. 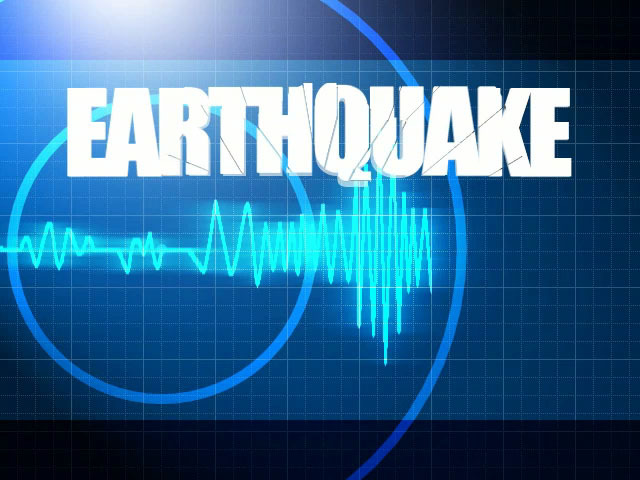 THE NATIONAL WEATHER SERVICE IN MEMPHIS HAS ISSUED A RED FLAG WARNING... WHICH IS IN EFFECT FROM 11 AM THIS MORNING TO 7 PM CDT THIS EVENING. VERY LOW RELATIVE HUMIDITY VALUES BETWEEN 17 AND 24 PERCENT WILL COMBINE WITH SUSTAINED 20 FOOT WINDS AROUND 15 MPH AND 10 HOUR FUEL MOISTURE VALUES AROUND 10 PERCENT TO PRODUCE VERY HIGH FIRE DANGER ACROSS THE MID-SOUTH THIS AFTERNOON. A RED FLAG WARNING MEANS THAT CRITICAL FIRE WEATHER CONDITIONS ARE EITHER OCCURRING NOW... OR WILL SHORTLY. A COMBINATION OF STRONG WINDS... LOW RELATIVE HUMIDITY... AND WARM TEMPERATURES WILL CREATE EXPLOSIVE FIRE GROWTH POTENTIAL. We are finally getting our best rain chances in nearly a month today as an upper-level low pressure system moves directly across the region. The cold temperatures aloft (typically associated with these types of systems) and heating at the surface this morning are fueling the formation of thunderstorms, some of which contain hail. The first round is moving mainly across east-central AR and north MS early this afternoon (see image above), however as the low approaches, scattered thunderstorms will be possible across the entire metro region through sundown. Stay with MWN on Facebook and Twitter (links below), as well as MemphisWeather.net on the web, for the latest on these storms and the forecast for the rest of the week. If you are viewing this post on the MWN Blog website, you will also find a tab above containing the latest radar/satellite imagery. 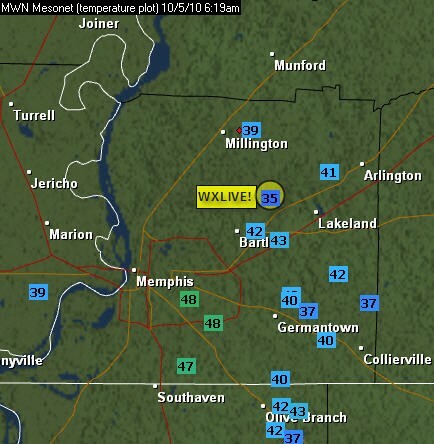 The Memphis urban heat island effect was in full force the past couple of mornings due to ideal conditions for radiational cooling in the suburbs and outlying areas, while the warmth of the city kept temperatures higher in the urban area. Radiational cooling occurs when heat escapes from the surface into the atmosphere, causing surface temperatures to fall. The heat island effect occurs when temperatures in a city are warmer than the surrounding areas. 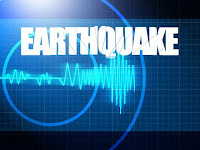 The effects are most pronounced at night, but can occur at any time. Nighttime conditions promote the heat island effect as cool high pressure and calm wind allows the outlying areas to cool more rapidly than the city. The lack of wind keeps the warmer air from the urban area from mixing with the surrounding cooler air over the outlying areas. The city cools more slowly than outlying areas due to the preponderance of buildings, concrete, and vehicles, while more vegetative ground cover and fewer buildings and less concrete in the suburban and outlying areas cool more quickly. The map above shows the temperatures around the metro area at about 6:20am this morning. Notice the upper 30s to lower 40s in the suburbs and mid to upper 40s in the city and at the airport (south side of the city) - a "dome" of heat over the city. The WXLIVE station operated by MemphisWeather.net in northern Bartlett is highlighted (see more data from WXLIVE). Photo above copyright 2010 and courtesy of Chuck Lajeunesse of Collierville Photography. Yet another fall cold front is poised to barrel through the Mid-South this afternoon. Once again, like Thursday, it will be a dry front and will bring only some clouds late today and this evening, as well as gusty north wind and quickly falling temperatures. The high today should rise to near 80 before the front drops us back into the 60s or upper 50s late this evening. Lows tomorrow morning will be in the 40s. On Sunday and Monday, the much cooler air behind this front will make it's presence known with highs only in the 60s. Monday morning will be chilly at the bus stop with some outlying areas potentially seeing patchy frost and temps in the upper 30s! A warm-up begins Tuesday as mid-level atmospheric temperatures quickly rise, allowing surface temperatures to also rise fairly quickly. We'll be back in the 80s by Thursday of next week. No rain is in the immediate forecast. For more details, check out the MWN Forecast from MemphisWeather.net. 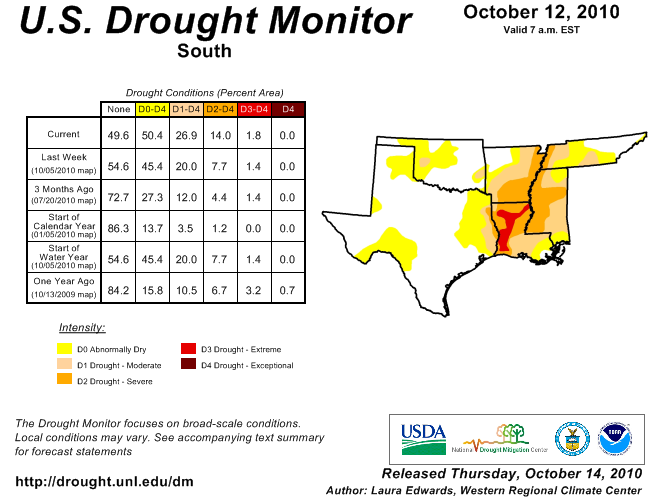 Drought conditions have worsened across the metro area, as well as eastern Arkansas and the Mississippi Delta, over the past several weeks. 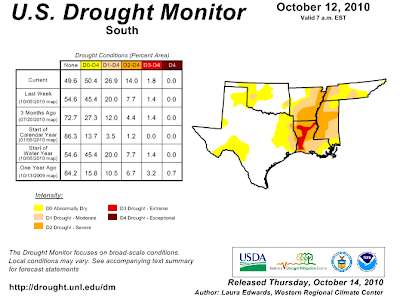 The U.S. Drought Monitor places much of the metro in a D1 ("moderate drought") condition, while eastern AR and the Delta are experiencing D2 ("severe drought") conditions, brought on by weeks of dry conditions and recent low humidity that aids in evaporating any available moisture from the ground very quickly. The recent drought and dry atmosphere have also prompted a elevated fire risk across the area, especially those regions in a D2 drought. Fire Weather Watches and even a couple of Red Flag Warnings (indicating optimal conditions for forest fires to be ignited and spread quickly) were issued this week by the National Weather Service. Traveling along the interstates this week, more burn areas in the medians were noticed, indicating the dry conditions that have resulted in grass fires from carelessly discarded cigarettes or other reasons. As long as the Mid-South stays very dry, there will be an elevated risk for grass, brush, and forest fires, especially with the lower humidities typical of autumn. Unfortunately, there still is no rain in the forecast for the foreseeable future and the seasonal drought assessment (click for map) indicates persistence of the drought conditions throughout the fall. Please remain aware of these conditions and exercise caution with open flame outdoors. You probably didn't know it, but October 1 is the start of a new year in the world of weather! 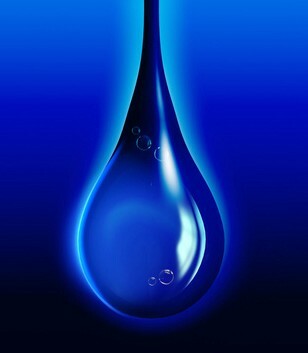 The Water Year (or hydrologic year) runs from October 1-September 30. From the CoCoRaHS program, the Water Year "coincides with the natural cycle of winter (cool season) snow and soil moisture accumulation and recharge followed by summer (growing season) water use and soil moisture depletion. This is the time of year when many rivers and streams in the U.S. run slow and clear (baseflow) awaiting the widespread precipitation that sometimes comes during fall and winter. Soil moisture and river flow in many parts of the country undergoes an annual cycle that tracks with this water year definition." For the last water year (October 2009 to September 2009), the Bartlett, TN CoCoRaHS station maintained at Cirrus Weather Solutions recorded 60.73" of precipitation (rain and melted snow or frozen precipitation). This is above the average annual precipitation for Memphis of 54.65" by about 6" - a wet year overall, despite the recent drought conditions. September typically marks the transition from the heat of a Memphis summer to the much more pleasant conditions of fall. While that transition did take place this month, it was much later in than any Mid-Southerner could have hoped for, especially after a very long and hot summer. Multiple high temperature records were again broken in September, including a week-long stretch of record heat from the 18th to the 24th, including the latest 100 degree day in recorded history, reached on September 20. 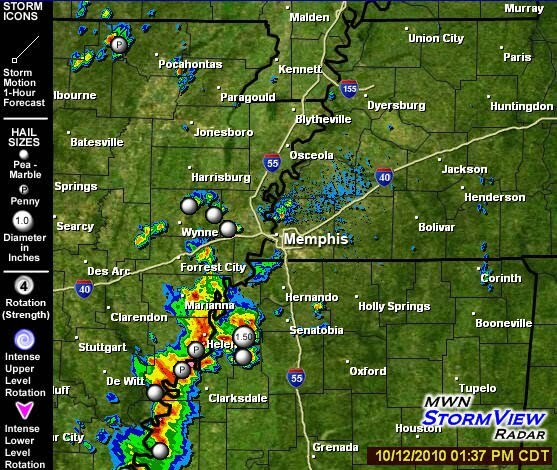 Finally, on the 25th, an autumn cold front moved through and brought an end to the "Summer of 2010!" In addition, very dry conditions persisted and parts of the metro area were classified as being in a "moderate drought" by the end of the month. For the month, the average temperature was 79.1 degrees, which was 4.3 degrees above normal. The average high temperature was 90.6 degrees and the average low was 67.7, with 19 days reaching a high of at least 90. Typically, only 7 days in September reach 90 degrees (making the average high of 90.6 even more incredible). The maximum temperature for the month was 100 degrees on the 20th and the lowest was 54 on the 28th. Precipitation for the month of September totaled only 0.14", or 3.17" below normal, making this month the 3rd driest September on record, trailing only 1928 [0.06"] and 1897 [0.00"]. There were just 6 days with measurable rainfall, the maximum one day total being just 0.06". There were no days in which thunder was recorded. The peak wind gust was 37 mph on the 16th, while the average wind speed for the month was 6.9 mph. Click here for a daily statistical recap for September. Bartlett also saw a very warm and dry month. The average temperature for September at the WXLIVE! station in north Bartlett was 75.1 degrees with a maximum of 98.2 on the 20th and a minimum of 45.7 degrees on the 28th. September precipitation ended up well below normal with a precipitation total of 0.12" and only 4 days of measurable rainfall. A co-located manual gauge used for the CoCoRaHS program measured 0.13" in September. The peak wind gust was 23 mph on the 16th. Average relative humidity was 65%. Click here for a daily statistical recap on MemphisWeather.net. For the month of September, the average temperature error in all MWN temperature forecasts was only 2.06 degrees, beating all compared computer models, including the National Weather Service, by 10% or more. Nearly 65% of the MWN temperature forecasts for the month were within 2 degrees of the actual temperature. MWN's forecasts extend out five periods (or 2.5 days). For dewpoint accuracy, the MWN forecast was also the best of the data sources at 2.45 degrees average error and was within 2 degrees of the actual dewpoint nearly 65% of the time. More detailed accuracy statistics can be found here.